asd and fuel pump relay toggle on and off . distributed pick up . help me please. Sounds like a vacuum leak. PLEASE!! do not be one of those people that blame the pcm!!! Keep doing research! google the hell out of it,dodge forum. Did you check for a vacuum leak? do you know how? My dodge ram has started bucking while driving and stalling at an idle. I think it may be the fuel pump. Any other sugguestions? My dodge minivan keeps stalling when idling. I cant find the fuel filter. Start a new Dodge Ram Van question. 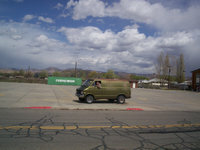 Looking for a Used Ram Van in your area? CarGurus has 3 nationwide Ram Van listings and the tools to find you a great deal.